It's retro review time again, this time we're going across the pond and back in time to 1988, and the American Wrestling Association's one and only pay-per-view, Superclash III. 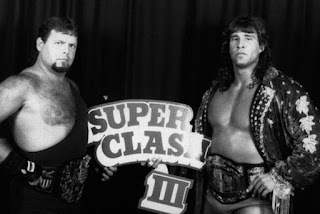 The show starts with an introduction from hosts Larry Nelson and Lee Marshall, who do a good job hyping the main event, a title unification bout between AWA Champion Jerry Lawler and WCWW champion Kerry Von Erich, before Nelson turns things over to ring announcer Gary Michael Capetta. The first match features the Rock 'N' Roll RPMs, a team I know next to nothing about, and their partner, a certain Cactus Jack, against three of the Guerrero brothers, Chavo (Classic), Mondo and Hector. Interesting point is that the referee is Mike Enos, who would go on to cause a lot of havoc in the AWA a few months later as one half of the Destruction Crew. A good opener here, with the team work of the Guerreros impressing me. Of course, old Cactus took a few crazy bumps, before the future Chavo Classic pinned one of the RPMs with a moonsault. Larry Nelson then interviews a young Nina "Ivory" Moretti about the upcoming lingerie street fight battle royal thing. Not sure if I got all the stipulations in there, but this was basically a hype segment, showing that Nina was getting too much caffeine back then as well. Back in the arena, it's a WCCW Light-Heavyweight title match between Eric Embry, a guy I used to mark out for big time, and a young, pre-Double J Jeff Jarrett. This Jarrett is a totally different model to the one we see today in TNA. A good, if somewhat short match, as Embry capitalises on Jarrett's shoulder injury, and pins him with a roll-up after reversing a sunset flip attempt, winning the title for the fourth time. Larry Nelson then interview another entrant in the battle royal thing, a woman dressed in black called the Terrorist. With her action and her speed talking, I found it hard to understand what she was saying. Where are the DVD subtitles when you need them? Then it's time for Handsome Jimmy Valiant to go up against the other half of the future Destruction Crew, Wayne Bloom. Bill Apter looks embarrassed at ringside after Valiant plants one on his lips. A fast victory for the Boogie Woogie Man as he make short work of Mr. Bloom. Larry Nelson is back with PWOW supremo David MacLaine and his girl Bambi. Basically another hype job for the battle royal thing. Texas Heavyweight title action next as Brickhouse Brown challenges Iceman King Parsons for his title. One question - why was the Texas title being defended in Chicago? Anyway, for some reason I just couldn't get into this match. The entire thing seemed to be very rushed. The ending came after Parsons pinned Brown after he walloped him with a foreign object. Then it's back to Larry again, as he interviews a tall blonde, Brandy Mae, and a short bird called Pochahontas. Then David MacLaine resurfaces. Both Larry and David start to sound like Jerry Lawler when they hype this battle royal thing. Six person tag action follows, as the DDP managed Badd Company team of Paul Diamond and Pat Tanaka team with Madusa Miceli to take on the team known as Top Gun, Derrick Dukes and Ricky Rise, and their partner Wendi Richter. 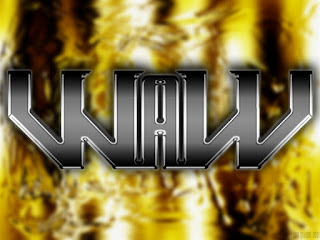 Both Richter's AWA Women's title and Badd Company's AWA Tag-Team titles are up for grabs. This is some two years before Tanaka and Diamond (as the masked Kato) became the Orient Express in the WWF. A lot of fast paced stuff here, but really nothing special to write home about. Richter pins Madusa after Tanaka accidentally super-kicked his partner. Madusa goes ape afterwards, and ends up getting spanked by Rice. Larry's back, this time talking to a guy for a change, Kerry Von Erich. Not really the best promo the "Modern Day Warrior" could have cut here, it hardly had me on the edge of my seat. He seemed preoccupied with his arm. I wonder why? Another AWA title match as Greg Gagne goes up against the future "Rugged" Ronnie Garvin for the vacant World TV title. An entertaining bout, if somewhat short, which saw Gagne winning the title via count-out after a brawl at ringside. After the intermission it's time for the tons of stipulation women's battle royal thing. So what we have here is tons of apparently clueless women pulling each other's hair in a cat fight. Typical David MacLaine stuff then. Words can't describe how awful this match is. This was eventually won by the Terrorist. If it wasn't for the fact I was reviewing this show I'd have fast forwarded through this crap. Hey, guess who's back? Larry Nelson then interviews a couple of irate ladies, Peggy Lee Leather and Luna. Basically just a bit of bitching here. Lee Marshall then introduces Bill Apter, who is there to give Jerry Lawler the Pro Wrestling Illustrated 1988 Inspirational Wrestler of the Year award. However, Lawler no-shows when introduced. Great piece of planning there. Then it's back to Larry, as he interviews Sgt. Slaughter about his boot camp match with Colonel DeBeers. Remember, this is three years before the Sarge began to salute the flag of the "brave Iraqi nation", so we've got to cheer for him as he spits on the camera. The Colonel is accompanied for his match by his manager, Diamond Dallas Page. A strange combination there. A good weapons filled brawl here, with Slaughter beating DeBeers with the Cobra Clutch. Afterwards, America's enemies, Sheik Adnan, from Iraq, and the Iron Sheik, from Iran, join DeBeers in attacking the Sarge, until the Guerrero brothers send the infidels running for cover. Our boy Larry then appears again, and Bill Apter finally gets to give that award to Jerry Lawler. Then it's WCCW Tag-Team title time, as the Samoan Swat Team, Samu and Fatu, along with their manager, former Freebird Buddy Roberts, defend the gold against another Freebird, Michael Hayes, and Steve Cox. As Hayes works the crowd to perfection, things don't really get going until the Samoans start to show their stuff. Not a bad tag bout here with the SST retaining the gold after Roberts interferes, reversing Hayes' pin attempt after a DDT while the referee was otherwise distracted. If you've only seen Fatu doing his lame dance as Rikishi, you'll be surprised with what you see here. Back to Larry as he interviews the two Sheiks about the Sarge. The usual anti-American stuff here. I'm surprised they didn't put a Russian in there as well. Wahoo MacDaniel then faces Manny Fernandez in an Indian Strap Match next. Before the match begins Fernandez challenges special guest Tatsumi Fujinami, the then-IWGP Champion. The Japanese star then helps MacDaniel attack Fernandez a little before the action starts for proper. Lots of brawling, bleeding and good use of the leather strap as a weapon from both men before the Chief wins the match by touching all four corners. Fernandez attacks MacDaniel afterwards, but the Chief was saved by Fujinami. Our friend Mr. Nelson then interviews AWA head honcho Verne Gagne, and his puppet president, Stanley Blackburn. First, they criticise the brutality of the last match, then they hype the upcoming main event. Main event time as AWA champ Jerry Lawler faces WCCW champ Kerry Von Erich in a title v title match. Lawler comes out to the Rocky theme, before well known radio announcer Al Lerner (well known to everyone except me) takes over from Capetta as ring announcer. Lawler and Von Erich literally beat the hell out of each other. Von Erich bleeds from two cuts, one above his eye, and one on his arm. It's a knockdown, drag out affair that goes back and forth, and is certainly worth the hype. After Lawler hits Von Erich several times with his trusty chain, Von Erich applies the iron claw, but the referee stops the bout because of Von Erich's blood loss, and awards the match, and the two world titles to Lawler. Before Lawler is interviewed by Lee Marshall, Von Erich storms off backstage with both belts. Larry Nelson interviews Von Erich backstage, and he's not happy about the outcome. Von Erich then argues with the prez, Stanley Blackburn, about the rules. Then we have tag action to finish off with, as the Stud Stable of Robert Fuller and Jimmy Golden take on the Rock 'N' Roll Express. Your usual type of tag match here which, for me, probably suffered from being put on after the double title match. The bout ended in a double disqualification after both teams brawled uncontrollably. Our buddy Mr. Nelson then interview the Stud Stable, who proclaim their superiority over the Crock 'N' Trolls. The show finishes with Lee Marshall interviewing Verne Gagne about the night's events, in particular the Lawler/Von Erich match. Gagne then goes off, probably to work out how much money he can screw his fellow promoters out of. In conclusion - I couldn't help but feel a little disappointed by the majority of this show. Most of the matches, including the various title bouts, lasted on average five-to-ten minutes. The title matches certainly could have done with an extra five minutes or so, so that those involved could show their wares to the pay-per-view audience. These matches seemed more like weekly TV show matches, hardly worthy or presentation on pay-per-view. Production quality wise, the AWA clearly wasn't going to spend the type of money the WWF were, but if they had jazzed things up a bit more, even putting ringside barriers in the arena, then the show may at least have had a pay-per-view feel about it. Commentary wise, Lee Marshall's efforts were certainly on a par with his contemporaries at the time, although his colour man, Ray Stevens, could have said a bit more. Overall, compared to some of the other pay-per-views from this time I've seen, this was disappointing. Only the Lawler/Von Erich match gripped me in any way. It was match of the show by a long way, and I can definitely see why this was the AWA's only pay-per-view. If the various bookers had changed their mindset a little, and booked for the bigger stage of pay-per-view television, then this so-called historic event may have had a greater impact on professional wrestling history.